Humans have funny relationships with the animals they love. If a person acts like a jerk, you might write them off for good. But if a beloved pet acts up, you probably just laugh at their behavior and give them a treat anyway, right? The following animals are acting like total jerks, but we bet you’re laughing at them regardless. It sure does pay to be cute! Just wait until you see the cat that totally photobombed his owners’ wedding photos. The grill was just about ready to throw on the meat, and then the brats are nowhere to be found. The first reaction would be to blame the dog, but this time it was the cat that stole the food for the BBQ. 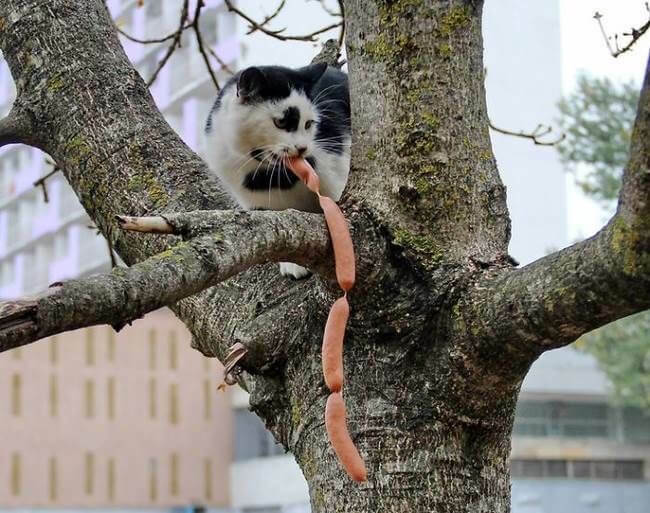 This cat managed to grab four sausage links and climb up a tree. He’s going to be a little disappointed when he finds out that meat tastes better when it’s cooked properly. Anyway, this cat is a total jerk for having ruined everyone’s’ delicious BBQ dinner. Even if they were able to retrieve the sausage, no one wants to eat that.